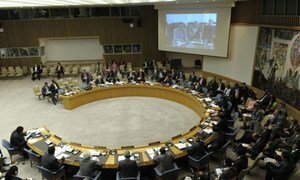 The Security Council today agreed to deploy a mission to Libya to support the North African country’s transitional authorities in their reconstruction efforts after the end of the conflict, including restoring the rule of law, drafting a new constitution, promoting reconciliation and preparing for elections. In a resolution adopted unanimously, Council members said the United Nations Support Mission in Libya (UNSMIL) will be led by a Special Representative of the Secretary-General for an initial period of three months. They also lifted some of the arms embargo, assets freeze and no-fly zone that had been imposed by the Council earlier this year after forces supporting the regime of Colonel Muammar al-Qadhafi began a brutal crackdown against many of its citizens. Today’s resolution tasks the new mission with restoring public security and the rule of law, promoting inclusive political dialogue and national reconciliation, and helping the National Transitional Council (NTC) embark on the constitution-making process and lay the foundation for an electoral process. UNSMIL will also help extend State authority, including through strengthening emerging accountable institutions, restoring public services, promoting and protecting human rights, particularly for vulnerable groups, and supporting transitional justice. The mission will take immediate steps to initiate economic recovery and coordinate support that may be requested from other multilateral and bilateral actors as appropriate. In the resolution, the Council made several modifications to the assets freeze, no-fly zone and arms embargo that had been imposed. The 15-member body exempted the Libyan National Oil Corporation and country’s Zueitina Oil Company from the asset freeze, and similarly eased measures against the Central Bank of Libya, the Libyan Arab Foreign Bank (LAFB), the Libyan Investment Authority (LIA), and the Libyan Africa Investment Portfolio (LAIP). Sanctions were also eased by the Council on funds, other financial assets or economic resources of the Central Bank of Libya, LAFB, LIA and the LAIP. The Council urged States to give due consideration to the use of international financial mechanisms to promote transparency and prevent misappropriation in Libya. It requested the International Monetary Fund (IMF) and the World Bank to work with the Libyan authorities to assess the country’s public financial management framework, and recommend steps to be taken by the Libyan authorities to ensure transparency and accountability with respect to the fund held by governmental institutions. The Council took note of the improved security situation in Libya and said it would keep the prevailing no-fly zone restrictions under continuous review, stressing its readiness to terminate those measures when circumstances permit. The Security Council has begun discussions on Secretary-General Ban Ki-moon’s proposal to set up a United Nations mission to provide support to the new authorities in Libya as they seek to rebuild the North African nation following this year’s conflict.